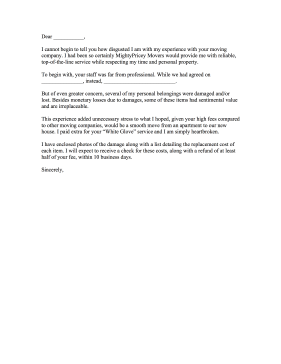 Use this moving company complaint letter to avoid getting gouged or shorted in service. I cannot begin to tell you how disgusted I am with my experience with your moving company. I had been so certainly MightyPricey Movers would provide me with reliable, top-of-the-line service while respecting my time and personal property. To begin with, your staff was far from professional. While we had agreed on _______________, instead, __________________________. But of even greater concern, several of my personal belongings were damaged and/or lost. Besides monetary losses due to damages, some of these items had sentimental value and are irreplaceable. This experience added unnecessary stress to what I hoped, given your high fees compared to other moving companies, would be a smooth move from an apartment to our new house. I paid extra for your "White Glove" service and I am simply heartbroken. I have enclosed photos of the damage along with a list detailing the replacement cost of each item. I will expect to receive a check for these costs, along with a refund of at least half of your fee, within 10 business days.